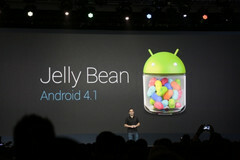 The new Android 4.1 Jelly Bean features a handful of improvements such as Project Butter which an in-depth effort to enhance performance and response time. Now the whole system is capable of 6ofps which results in smoother and quicker animations and the CPU reacts the instant a touch is detected. Google has pulled the wraps off the long rumored Android 4.1 version at the I/O conference in San Francisco and the latest OS is named "Jelly Bean". The rumors seem to be spot-on like always. According to Liliputing, Google is going to release the source code for Android 4.1 in mid-July along with over-the-air updates for the Motorola Xoom tablet and other flagship Android devices. Just 6 months ago, we saw Google releasing the Android 4.0 Ice Cream Sandwich and now it has come up with yet another version with the Android 4.1 Jelly Bean. The move by Google is rather abrupt considering that most legacy Android devices are yet to receive the Android 4.0 upgrade. All things aside, the new Android 4.1 Jelly Bean features a handful of improvements such as Project Butter which is probably the most noteworthy. As Engadget reports, Project Butter is an in-depth effort to enhance performance and response time. Now the whole system is capable of 6ofps which results in smoother and quicker animations and the CPU reacts the instant a touch is detected. The Home Screen also comes with added features like dynamic resizing of widgets and they can be removed just by flicking them off the screen. Another notable feature is the Offline Voice Input which allows users to tap the microphone and dictate a message even in airplane mode. The camera app has gotten even better than it had already been in Android 4.0. Now the last clicked picture can be viewed by swiping to the left in between shooting. While swiping through images, users can pinch out and all images will appear in a filmstrip and swiping an image off the screen will delete it. Any accidental deletion can be restored back by tapping the undo button. Images and videos can be shared through Google Beam and pairing with Bluetooth is now provided by NFC. Voice search now even speaks back answering your questions. Predictive text and recommendations have been added to the on-screen keyboard. The already great notification system has become more dynamic with an interactive, unified Inbox. Now messages will automatically expand and shrink as they roll in and canned responses are even integrated. Another new feature is the Google Now, which makes use of the search history, location, calendar events and other data to automatically provide information. Then there's the transportation feature that provides with the bus or train schedules when near a bus stop or a train station, while travel times and suggested routes are also provided automatically while travelling or going to work. So, do not worry where Google can reach you. Come mid-July and you can experience all these features and lead a convenient life.